As congressional Democrats spent the week pressing for the passage of new gun control legislation, violent felons in Virginia were able to take steps towards having their right to own a firearm restored thanks to action taken by the state's Democratic Gov. Terry McAuliffe. When McAuliffe restored the voting rights for 206,000 felons in a move critics say was politically motivated, he also opened the door for those felons to have their right to own a firearm restored. Previously, felons would individually have to petition the executive branch to have their civil rights restored. Petitioners would have to fill out an application to the secretary of the commonwealth and submit a letter to the governor explaining why they deserve to have their rights restored. Decisions were made on a case-by-case basis. This was abandoned when McAuliffe restored the rights for both violent and nonviolent felons, eliminating the need for any application. Included in the civil rights McAuliffe granted through his sweeping order is the ability to petition a local circuit court judge to restore firearms rights. The secretary of the commonwealth warned the courts that this would cause a spike in gun rights requests. Among the individuals who have already taken advantage of the change is Rodell Callahan, a 36-year-old man who has a long history of violent behavior. Callahan was first convicted in 1998 for holding up two women at gunpoint in a Virginia mall. He earned his second felony conviction in 2004 for beating up a woman he had a child with. He has had multiple domestic violence convictions since 2013. Callahan, who had his civil rights restored by McAuliffe's executive order, applied to have his gun rights restored earlier this month. "If the governor trusts me to get my rights back … why won’t the circuit court trust me to get my firearm license?" Callahan said in an interview with the Richmond Times-Dispatch. "With everything going on in the world, it’s crazy. You got people shooting up nightclubs." Circuit courts can reject applications, but local prosecutors say the whole review burden has been shifted to them and they don't have the resources to do extensive research for each firearms license request. It had previously been standard practice to use the executive branch's approval of a felon's application as the "main factor" for the restoration of gun rights, according to Joel Branscom, a commonwealth attorney in a rural Virginia county. "That’s always been the main factor," Branscom told the Washington Post. "Once the governor has weighed in, it’s been pretty regular [practice] for them to get their rights restored. That meant something." McAuliffe has written off the complaints by attorneys who oppose the measure on grounds that they will not be able to handle all the gun rights requests. "Do your job. I do mine," said McAuliffe earlier this week. "And I don’t complain about my workload." Jason Pelt, a Virginia lawyer specializing in gun rights restoration, says he has received more than two dozen calls from potential clients in recent weeks. "The most anti-gun governor in a long time in Virginia just made it incredibly easy for felons to get guns," Pelt told the Washington Post. Gun rights groups told the Washington Free Beacon that McAuliffe's actions are not consistent with the way he treats law-abiding citizens. 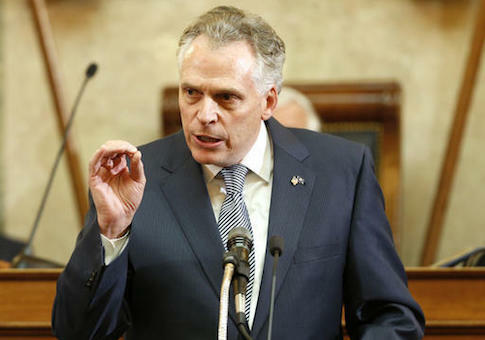 "While Virginia Democrat Governor Terry McAuliffe wants to restrict the Second Amendment rights of lawful citizens his policies help arm violent felons," said Alan Gottlieb, president of the Second Amendment Foundation. The Virginia Citizens Defense League, which has long held that non-violent felons who have done their time should get their gun rights back, says that rights restoration for violent felons "should be on a careful case-by-case basis." "The governor’s blanket actions on violent felons shows that while he is busy trying to make it harder for Virginia’s law-abiding citizens to purchase and carry guns, he is willing to make it easier for some very violent, dangerous, and possibly unrepentant, criminals to do the same thing," said VCDL president Philip Van Cleave. "The Governor’s gun-control priorities are interesting, to say the very least." Included in the batch of felons who had their rights restored were more than a hundred "sexually violent predators" who remain under supervision because the state deemed them too dangerous to be released. Virginia Republicans filed a lawsuit last month to block the measure. The Supreme Court will hear the case in July. This entry was posted in Issues and tagged Terry McAuliffe. Bookmark the permalink.